Will the police and fire departments merge to become a public safety department? That’s what some think the new police officers’ employment contract will lead to. Hamtramck police officers have a new employment contract, but not everyone in the community is pleased. While officers will enjoy a bump up in pay (6 percent), there is a clause in the contract that is causing controversy. The contract says that the city administration has a right to exercise an option to have officers cross train as firefighters. The city is agreeing to pay for the training and give those officers who finish the training an extra $1,000 annually. The contract is good through 2019. What has some people upset is that the cross-training may lead to doing away with an independent fire department and creating a hybrid that is commonly known as a public safety department. In this scenario police officers and firefighters cross-train for each other’s roles. Some communities have tried this approach, and it has been met with varying degrees of success. In the case of Hamtramck’s neighbor, Highland Park, it proved to be a failure and the city went back to two independent departments. But there are financial circumstances facing Hamtramck. GM recently announced that it will cease production and its Detroit-Hamtramck Assembly Plant, known commonly as the Poletown Plant, which could possibly lead to a complete shutdown. That would mean a loss of $850,000 to $1 million annually for Hamtramck. On top of that, it is feared that Wayne County will walk away from its county jail located in Hamtramck once its new downtown facility is completed in a few years. That would be a loss of about another $1 million annually. “We have no other options at this point,” said City Attorney James Allen in regard to starting cross-training. That’s because a federal grant that had been subsidizing the salaries of firefighters — about $2.3 million per year – for the past several years may not be available, or will be scaled back. The city’s fire department’s budget is $3.3 million a year. Mayor Karen Majewski underscored that having police officers cross-train is just an “option” – not a done deal on establishing a public safety department. It has also been pointed out that Hamtramck firefighters participated in over 800 runs in 2017 in a special mutual aid agreement with Detroit and Highland Park. 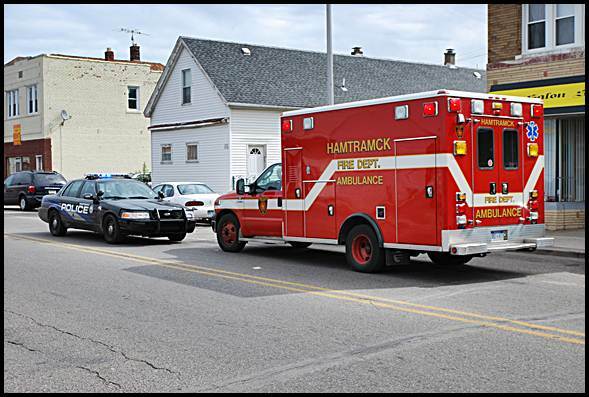 To the surprise of some, less than 100 of those runs actually involved a call in Hamtramck. In other words, the majority of work being performed by Hamtramck firefighters is in Detroit and Highland Park. That has begged the question of how balanced that agreement is and what the eventual cost will be from the wear and tear of Hamtramck’s trucks and equipment. There are other options for providing fire service, but nothing that city officials have talked about publicly. One would be to ask voters to join a fire authority with East Pointe and Hazel Park, who already have a joint agreement. That would also require voters in those two communities to allow Hamtramck to join – which would be challenging politically, to put it mildly. Other options include scaling back the department’s fulltime force and filling in the other positions with part-timers. Or, the city could just contract with Detroit to take over the service. For many residents, the only option that is acceptable is for an independent Hamtramck Fire Department. Just how the city would continue to fund it, though, has yet to be answered. Rachel Renee Srodek spoke out against cross-training in a Facebook post. 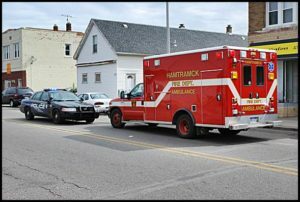 “I am so disturbed and disgusted with Hamtramck’s administrators they want public safety in our city, they want to get rid of our fire fighters,” Srodek said. At last Tuesday’s city council meeting, the police contract was approved, with only Councilmember Andrea Karpinski, the sister of Srodek, opposing. Karpinski said that she couldn’t support the contract because the concept of cross-training should have been brought up months ago so the council could fully discuss it. There is a ton of misinformation in this article. For instance the safer covers about a million a year not 2.3 million a year. In regards to the detroit/highland Park agreement those numbers are completely false as well. The department has averaged about 350 mutual aid responses to Detroit and Highland Park together per year in the last four years of the agreement. Furthermore, the fire dept in hamtramck averages about 1000 runs a year which means roughly 600 not “less than 100” are actually in Hamtramck. In regards to the police officers contract, their payraise over the two year contract is in fact nine(9)% not the six(6)% reported. There are also questions regarding the gm shutdown and how much money the city would actually lose. The personal property tax has already been repealed my the state of Michigan which means gm doesn’t pay anything for the equipment inside of the plant after its initial purchase. Income tax collected from the very few workers wouldn’t have much effect. And gm does not plan to bulldoze the site. So they would still be paying property taxes through their agreement on an improved lot. How would we lose almost 100% of the current revenue we see from them? Fear-Mongering to pass the Marijuana ordinance. Nasr you know all about fear-mongering. We do not have a study disclosing projected revenue losses that would be expected from the closure of the GM Poletown plant. A key question is how huch more revenue could be expected if the county jail facility in Hamtrack is shut down? One extra issue is that the contract negotiated only runs through 2019 – that is only about one year away. The article references “fear” that the county jail operating in Hamtramck will close – is this just speculation or has there been actual public discussion by county leaders actively proposing this scenario? Wayne County Sheriff’s Department in the last several years has had such a crisis in locating jail space for its incarcerated criminal population they have had to send a percentage of its inmates to county jails outstate under service agreements. the concern is that once the new wayne county jail is built (https://www.freep.com/story/news/local/michigan/wayne/2018/03/07/wayne-county-jail-detroit-michigan/402364002/) the one in hamtramck will become obsolete and closed. The Dickerson facility provides corrections services geared toward misdemeanor offenders and, also, convicted felons serving short jail terms as part of a probationary sentence. The current Wayne County Jail is located next to the Frank Murphy Hall of Justice and provides easy transfer for pretrial detainees whose felony cases are awaiting adjudication in the circuit court in that building. Given there are two different types of inmates that are served by the two institutions mentioned, it is doubtful that the Dickerson jail would be fully shut down – even if Wayne County does construct the new jail as envisioned. I do not consider Dickerson to be “obsolete” – it is far newer than the Wayne County Jail and is considered to be far superior in quality of facilities compared to the Wayne County Jail.